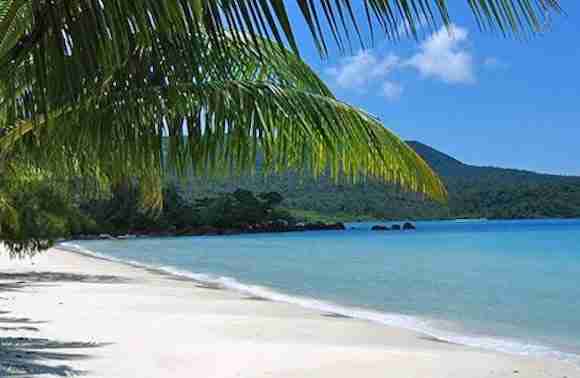 Sihanoukville is famous for its magnificent tropical islands with its beautiful beaches. Sihanoukville is actually a name of province in Cambodia. It is located in the south coast of Cambodia, near the Bay of Thailand.The province is actually quite small but it offers so many interesting tourist attractions. Checkout our travel tips to Cambodia before going and best beaches in Cambodia. Getting to Sihanoukville is quite easy. It can be reached easily from many places. If you already in Siem Reap, Cambodia, you can take a direct bus. It take more or less four hours to get to Sihanoukville from Phnom Penh. If you are from other countries, just take a flight to Phnom Penh and take a bus to go to Sihanoukville. If you are looking for one of the best beach side destinations in Asia, Sihanoukville is one of the most recommended places to go. 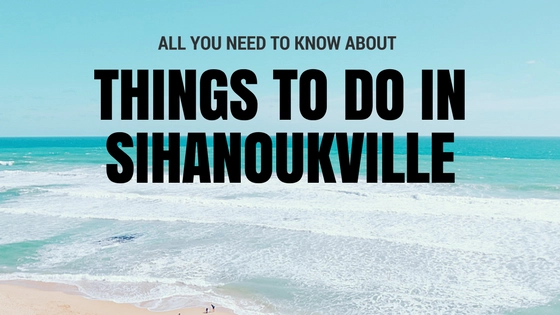 Here, not only can visitors to Sihanoukville enjoy the wonderful beaches, there are other things to do in Sihanoukville. What is the Best Time to Visit Sihanoukville? Many visitors to Sihanoukville, visit between November to February. The reason is the weather. During the aforementioned months, the weather is cool yet it’s sunny most days. The weather is perfect for holiday as you won’t feel too hot during your visit. It’s not recommended to visit this place between July and October because its rainy season. 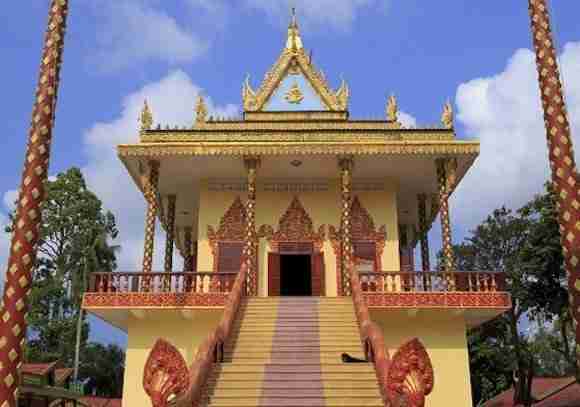 Sihanoukville is not only well-known for its port and natural treasures but also for its Buddhist temples. Wat Leu is one of the major Buddhist temples in Sihanoukville. It is one of the most popular tourist attractions in Sihanoukville. This temple can be reached easily and quickly from the town center as it is only 6 kilometers away from the provincial town. Situated on the mountain, you can enjoy wonderful landscaped forest as well as the panoramic views of the islands and town nearby from the location of Wat Leu. Not only are visitors offered with stunning natural views, they can also learn the history about the temple. This temple also attracts those who are interested in the architectural point of view. Wat Leu is well-known for its unique architectures. It is surrounded by a high wall made of stone. There are a statue of white elephants with three heads decorating the stone wall together with three Buddha statues. The golden colour of the temple makes it look royal and elegant. The design also incorporates traditional flair, making the whole temple looks astonishing. There is also a big Buddha statue in front of the temple. The statue is coloured in black, contrasting with gold colour. The exceptional design of the building makes this spot is really photographable. Many visitors can spend hours just to take photos. Any visit to Sihanoukville is not complete without visiting its beautiful beaches. There are plenty of recommended beaches you should stop by. The first is Otres Beach. It is a perfect beach to get relaxed, enjoy wine, and dine. The best time to visit this beach is in the afternoon. While waiting for the beautiful sunset, you can walk along the shallow safe beach. Another recommended beach is Independence Beach. The beach has similar characteristics as Otres Beach. It has clean water and small waves, perfect for swimming and paddling. Serendipity Beach is another popular beach. There are many accommodations, bars, and restaurants which are open until late at night. The beach has a beautiful view and nice facility. Actually there are some other beaches located in smaller islands, ideal for island hopping. Some of them are Koh Tang Island, Koh Pos and Koh Dek Koul. These islands are called as private islands because not many visitors has come to the places. For those who enjoy outdoor activities, they should not miss the adventurous boat tours and water sports. The boat tours will bring you a great and fantastic experience of sailing through the ocean, enjoying the perfect view. Here you can also have an opportunity to meet new people as the tour usually includes a lot of people. Most tours include scuba diving and snorkeling. If you have never snorkel, don’t worry because the water sports are safe for beginners. There is an instructor that will guide you to snorkel, enjoying an amazing underwater view. Some other tours include river rafting, fishing charter, waterskiing, jet skiing, parasailing, or paragliding. Due to the various options, you can choose the one that suits your hobby and travel style. Wherever you go for a vacation, you must try to find some places to look for souvenirs. Actually Sihanoukville is not really a paradise for shoppers because the options are quite limited. 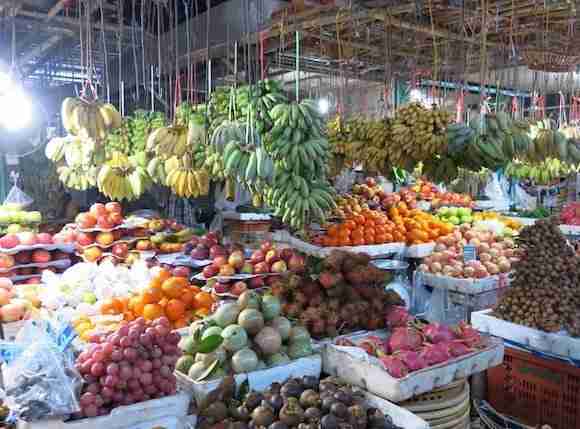 here are some markets you can visit for shopping. First, you can go to Otres Market which is located in Otres Village. The market is quite unique and worth-visiting. Not only is it a market but it is also a nightlife venue where music is performed. Most of the visitors of this market is international tourists. Locals are not really interested in this place. Here you can buy a wide range of bohemian wares such as crystals, jewelries, and sort of. You can also have your dinner as there are many stalls selling foods, snacks, and beverages. The place is open at 4 in the afternoon. If you are looking for a gift, go to Tapang’s at Otres Beach. It is center of homemade souvenirs sale such as cute bags, dolls, shoes, phone casings, and many more. The store opens every day from 11 in the morning until 9 in the evening. For those who are a fan of fashionable clothes, Unique is the place to go. Here you can shop for a clothes, shoes, and accessories in bohemian style. The store is quite small but very popular. It is located at Serendipity Road. Sihanoukville has loads of guest houses, hostels, and hotels. Here are a few places to check out if you are planning to visit Sihanoukville Cambodia. Located in Otres Village nestled within private gardens. Free WiFi is available in all rooms. This property is 4 minutes walk from the beach. Each air-conditioned room includes a refrigerator and a cable TV. Some rooms feature a seating area where you can relax. A terrace or patio are featured in certain rooms. The rooms have a private bathroom. Situated on the banks of the Ream River, about 20 kilometres from the Sihanoukville, Ream Yacht Club (Hidden Valley Resort) offers peaceful accommodations with views of the river and mountain. Surrounded by natural environment, the units at the resort are equipped with a seating area and a private bathroom with free toiletries and a bath or shower. Certain rooms are fitted with a kitchen with a fridge and a satellite TV. The Big Easy is located in Sihanoukville, 6 km from Otres Market. Popular points of interest around the property include Serendipity Beach Pier and Serendipity Beach. Free WiFi is provided and bar. 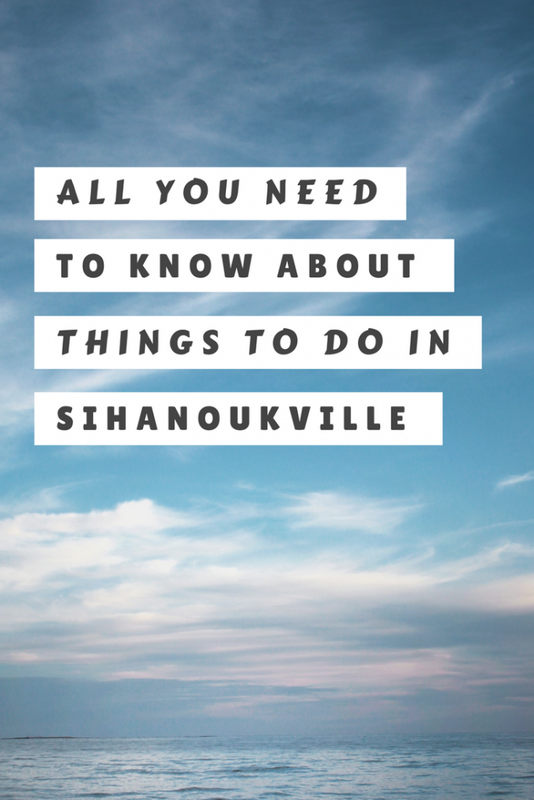 Finally, those are only a few of the things to do in Sihanoukville that you can try during your visit. If you decide on visiting Sihanoukville, you can explore the other spots. And that’s it for now!I’d love to know if this guide on the things to do in Sihanoukville Cambodia has helped you. Let me know if you have any questions and let me know if you go too.